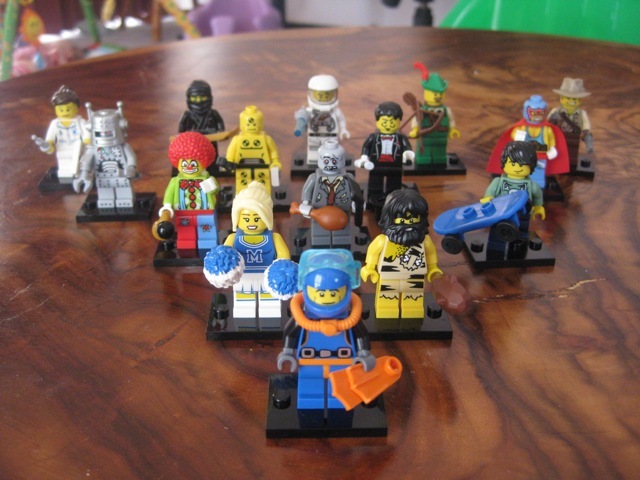 So, if you're a Lego fan, you might have heard about the new individually, blind-packed, 1st series of Minifigures. Because they're blind packed, it's going to be a bit tricky getting the ones you want, especially as you narrow it down to getting the last one or two of the sixteen available in the first series. While I've spent tens of minutes feeling up packs in various Toyworlds, In my first six, I've already got two duplicates. The lady at the shop pointed out that it would be good if you had a friend who was also interested because you can trade the duplicates for ones you don't have. So, I thought I'd see if anyone was game here. By my calculations, it should cost $1.10 for a padded envelope + $1.10 for postage, so for $2.20 as the cost of trade, we should be able to get what we want. So, while that might be $2 on top of the approximate $4 you paid, some might find it worth the premium to know you're getting exactly what you need. Settle down. I havn't even seen these yet. If you cant be arsed with the barcode system, a good tip is to not buy blind packs that are next to each other horizontally as people have found that the same minifig seems to be commonly packaged along rows. But given that people will be ruffling through blind packs and messing up the order this tip is probably redundant unless you know the box is fresh. The barcodes are all the same on my six. Got a link referencing any methods for differentiation? MV's nailed it. Though I heard theres a difference in the barcode systems between EURO and US stock. I'm not sure which of the two regions Australia recieves its stock from. Though this is only a problem if you're only after a select number of the minifigs instead of all of them. Gotchya. Thanks guys. I just noticed that second barcode this morning. Yeah, that worked a treat! Unfortunately I made one booboo and got a spare Archer instead of the Indian, but will had back and do a swap.